Some residents of Tamale Monday morning took onto the streets to express anger and disappointment over the poor state of the metropolis’ inner-city roads. It comes few days after President Akufo-Addo cut sod for construction of an interchange in the city, first of such infrastructure in the whole of the north of the country. 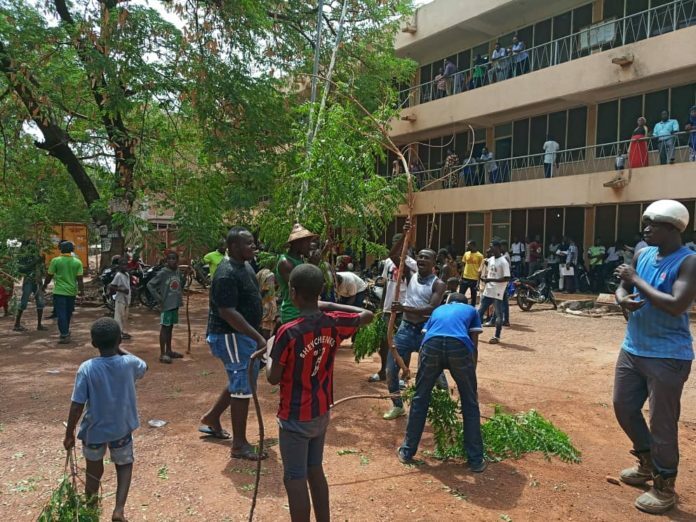 Residents of Gumbihini, where a court litigation between the city authorities and some landlords has stalled the construction of a road and drainage system, drummed through the streets to the Tamale Metropolitan Assembly building where they held tree branches and chanted songs of frustrations to demand immediate resumption of the projects. Gumbihini is a flood prone area where flood disaster occurs every year. In 2017, when a major flood catastrophe hit the metropolis , the Mayor, Musah Superior, directed the demolition of all houses and structures built on waterways. In 2018, the metro assembly secured a funding for construction of the Gumbihini area roads and drain projects. Residents to be affected were timely compensated and given timeline to vacate for the works to begin. Majority of the affected landowners have evacuated but the projects faced fierce resistance from four neighbors who have dragged the metro assembly to court in protest against destruction of their properties. The assembly, which was racing to finish the projects before the rains sets in, has been forced by Tue action of these four individuals to abandon the infrastructures. Angry by the development, the community members came out publicly to accuse the individuals of blocking infrastructural development to the area and petitioned the assembly to use force to push them out. One protester said: “Since the begging of this year, most of us have been engaged removing our things just to leave for this road to be constructed. So of them have been exhuming remains of our relatives for reburial in different locations, and we do all this, only for some four people to be resisting. We want to tell the Mayor that we will destroy the properties, because we well took the compensation”. Another said, “We want to tell Mayor that, we are ready for the road, he should come out. Because of the roads we remove our Zinc and destroy our houses. So, because of four people ghat you don’t want to come and do roads or what?”. The Mayor was out of office the demonstrators arrive. The Public Relations Officer of the Assembly and one other official received the petition on behalf of the MCE. “We have just received this petition from the Gumbihini community led by their group leader. This petition is in respect of the road project that has been stopped due to some litigation by four household or so”, Issahaku Musah told starrNews in a brief remark to acknowledge receipt of the petition. “This is a demonstration by the people of Gumbihi that they really need the project and that they would support the metro assembly to proceed with the project, regardless of the obstacle that has been brought on our way. And this obstacle is the legal suit by these four landlords”, he said. “So we will study the petition and act on it”. Next articleOpinion: Bring down this billboard!